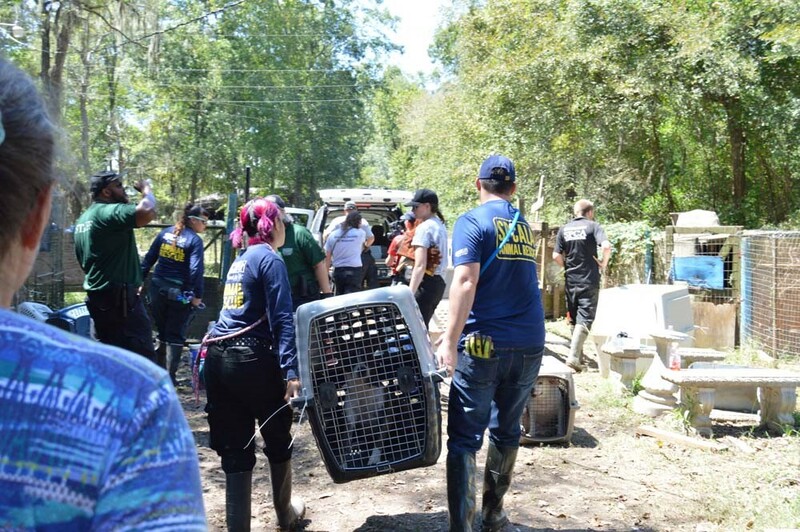 Los Angeles, CA — Members of Society for the Prevention of Cruelty to Animals Los Angeles (spcaLA) Disaster Animal Response Team (DART) are closing in on the sixth day in Houston assisting with Hurricane Harvey response efforts. Yesterday, the team joined forces with Houston SPCA, Michigan Humane, and Humane Society for Missouri to rescue 67 dogs and cats from a property in Cleveland, TX. that had been flooded by Hurricane Harvey. The couple who owned the property were boating in and out to feed the animals, but soon realized that they needed help. The animals, in varying states of health, were relinquished and removed from the property. No criminal charges will be filed. Since early Sunday morning, DART members have cared for hundreds of animals displaced by the storm. spcaLA is assisting Houston SPCA in any way needed including investigations, animal care and transport, and distribution of pet foods and supplies. The effects of Harvey are devastating, and recovery efforts will last for months. spcaLA is monitoring Hurricane Irma, and will be ready to answer the call for aid from our fellow humane organizations in Florida.